LG has announced it is to release a 15-inch OLED TV into the consumer market this year. This isn't the first time LG has dabbled in OLED technology, with its latest range of mobile phones sporting AMOLED screens. But it will be a significant launch both for the company and the technology. The news slipped in an interview with OLED-info. When asked about LG's stance on OLED TVs Won Kim, Vice President of OLED Sales and Marketing from LG Display, said: "During the period of December 2009 to January 2010, our customer will launch 15-inch OLED TV in [the] Korean market. Thereafter global roll-out follows." 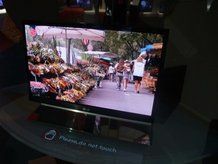 The OLED TV in question was first spotted at this year's CES in prototype form. Currently, Sony is the only company to come to market with an OLED TV. It's 11-inch XEL-1. Currently the television is available for the pricey price of £3,499. It's still uncertain just how much the LG OLED will be when it (hopefully) hits the UK in 2010.